2. Internet connection to install the app. So lets see on how to add this extension and set it up for working in offline mode..
2. Navigate to this page. 5. 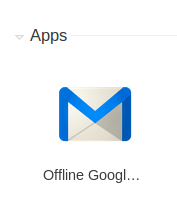 Next to click Launch App..
After it has installed a new tab will open up and you will see the Offline Google Mail there below the apps tab. 6. Click on that and now you will be taken to a page where you are gonna set it up. 7.You will be shown the following page. And yes now you are in your inbox. 8.Disconnect your internet connection and try it out. 1. You can view your mails offline. 2. The speed is really amazing. 3. You can compose mails offline which will be sent the next moment you connect your internet. 4.You will be able to access everything that you can access from your gmail account except that of chat.